Last week, a grand coalition of all the leftist parties of Nepal was announced, much to the surprise of not only seasoned political watchers but even members of their own political parties. 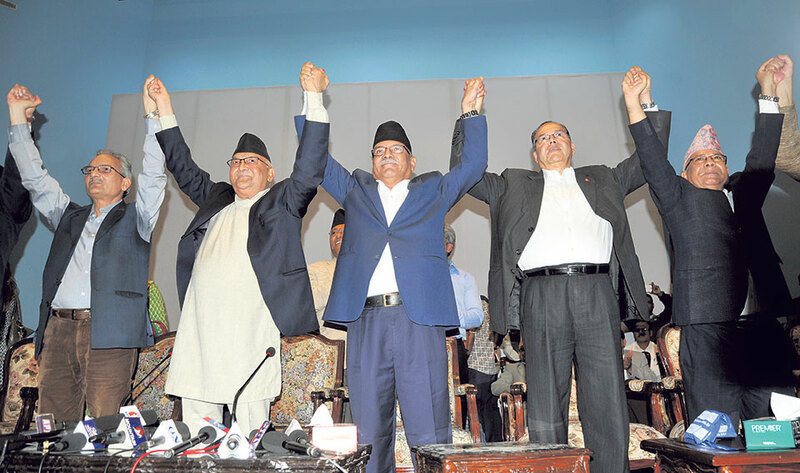 This end of Dashain political theater made for good headlines with the pièce de résistance being the photo opportunity at the end with five former prime ministers (no less) holding hands in a triumphant gesture – apparently as a result of having achieved something momentous. Even amongst the rank and file communists there was no small amount of euphoria at their leaders having finally come good after all these years. It is supposed to herald a new shift in Nepalis political culture but a lot of pragmatic folks however, including many members of the respective parties, were distinctly underwhelmed. I mean, how many times have coalitions of convenience been established to contest polls, to attain or retain power? The only amusing thing about this whole charade must have been the look on Sher Bahadur Deuba’s face when he heard of this ‘unnatural alliance’. His alliance of understanding and compromise in Bharatpur for the first phase of elections was totally natural, I suppose. 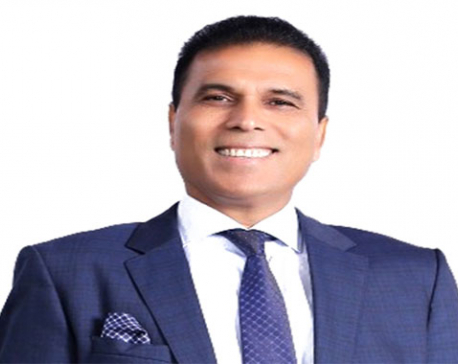 It must have drained all that Dashain booze out from his system and, I suspect, he was infinitely better prepared for Sajha Sawal than he was for this news bomb in the run up to the election. Anyway, this time round this union of supposedly hard-line socialists is based on their common ‘ideology’– the same ideology that they have been religiously following and practising all these years. In the media interviews after the event, all the party representatives of the fledgling alliance took great pains to state that this hadn’t been achieved overnight but has been a natural evolution many years in the making. Perhaps, that explains the triumphant photo-op of the five former prime ministers. Yes folks, you read that right. Socialist ideology, it is principles and a love for the motherland are the reasons being thrown about for this alliance – not desperation, political irrelevance or purely election related compulsions. If these folks are communist then I must be one too because I wear a ‘Che’ Guevara t-shirt. Get the analogy? Oh, maybe they are like me in other ways. I’m a ‘bahun’ but not a practising one, you see because it’s terribly inconvenient. So maybe this lot are ‘non- practising’ communists. It’s laughable that the same ideology and principles that have more often than not burdened political parties ever since the start of multi-party democracy are the same ones trotted out when the going gets tough or it is politically convenient. Every one of these parties would form an alliance with the Mickey Mouse Fan Club if it suited them. What’s even more bizarre is that a coalition that purports to be a new political force unites on a set of principles – or at least the revolutionary form of it that they are meant to be espousing – that is widely discredited. I know my fair bit of disillusioned communist supporters because, in Nepal, time and politics have proven that nothing seems to unite the communists like the opportunity to practise a bit of crony capitalism. Communism is only for the masses. In fact, at one point after the end of the revolution and the CPA in 2006, Prachanda put on so much weight I thought he was going to burst. It reminds me of the old joke about communism being the longest and most painful of the roads to capitalism and no one knows this better than our communists. To be honest, ideology and principles are as meaningful in Nepal’s politics as a knife in a gun fight. On the political spectrum it’s really hard to tell who is left, right, centre, in between or nothing. A party’s stand on any issue or their beliefs depends on which way the political wind is blowing or who it stands to benefit or hurt, not trivial things like principles or ideals. An apt example would be Dr Govinda KC, who (bless him) has had to fight literally every government and coalition to fulfil his demands. Every time he goes on a fast, it is inevitably the opposition of the day that pays him a visit and empathizes with his cause while doing nothing when they come to power. How many times have we seen this cycle repeat itself with every change of government? Chalk it down to the slow news days of Dashain but a lot of newspaper columns have devoted inches to the imminent unification of the leftists, what it means for the other political parties, the future of our country and our political culture. This whole unification and polarization thing seems to have taken on the air of a foregone conclusion when there are still miles to go. Whatever happens, at the moment we are being treated to the same old trick. ‘Glasnost’ and ‘Perestroika’, it isn’t.